One of the core principles of traditional Eastern medicine is that the wellness of our mental, emotional, and spiritual bodies is strongly linked to our physical health. In 2016, a spiritual director requested that this principle be extended into the interior renovation of his recently acquired wellness centre specializing in eastern medicine. Located on a busy and eclectic stretch of Yonge Street in Toronto, the aim was to transform the existing commercial space into one that evoked a sense of calm and mental clarity. Taking inspiration from the philosophies of Japanese aesthetics, a subtle but refined material palette was adopted for the interiors. A luminous reclaimed wood screen suspends from the ceiling in the reception area, while a custom designed bench – complete with traditional wood joinery – lines the entry wall. The reception desk, deriving its sensuous form from a river stone, was meticulously crafted by a local artisan using both traditional and digital fabrication methods. In stark contrast to the brightly lit, sterile environments of contemporary medical offices, the wellness centre is softly and carefully illuminated to create a sense of warmth and intimacy. 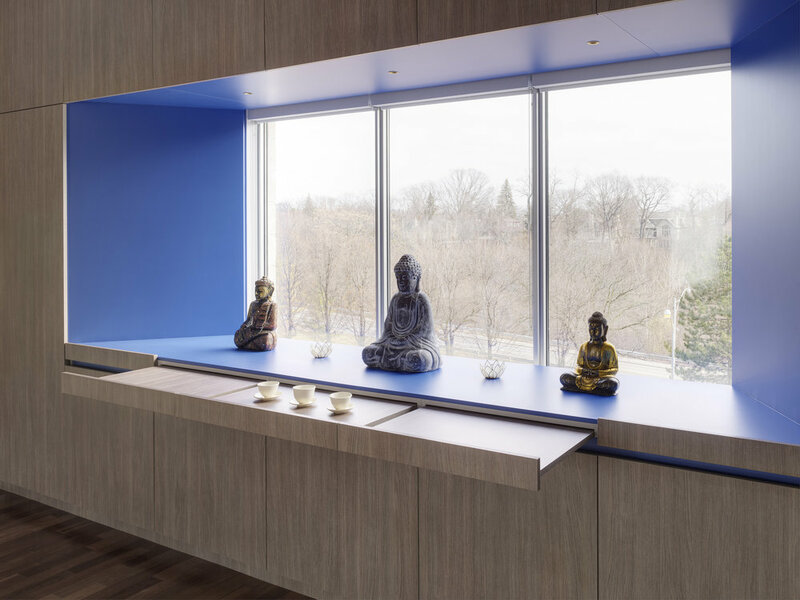 In the yoga studio located on the top floor, a full-height millwork cabinet frames a beautiful view overlooking the Don Valley while also serving as a Buddhist shrine. 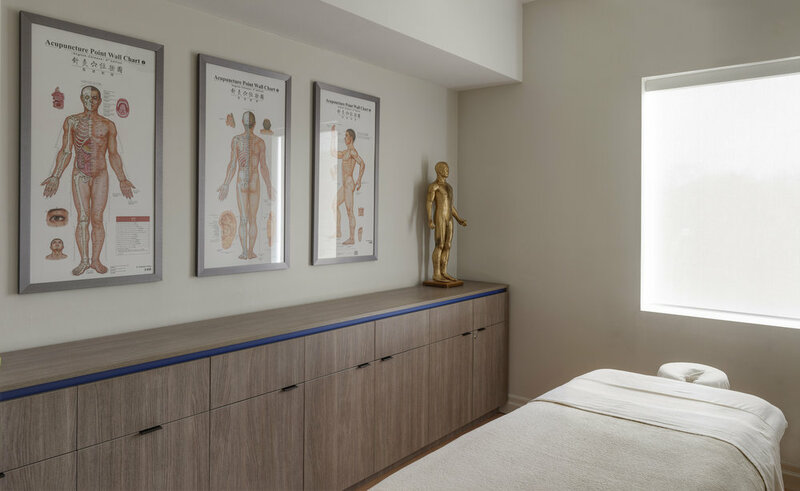 The design of the millwork is conceived as a framework to metaphorically connect the physical self with nature and spirit. Designed with minimalist detailing but embodying the principles of ancient traditions, the wellness centre is a modern retreat nestled into a cosmopolitan context. Specific programmatic requirements inspired a design approach that embraced restraint and quietude in its expression.